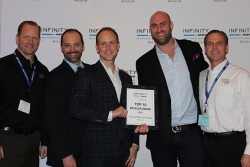 Lifetime Windows & Siding wins Marvin’s top honors at the Infinity from Marvin Executive Forum. Denver, CO, February 07, 2018 --(PR.com)-- It has been a busy year for Lifetime Windows & Siding. This fall they were awarded the “Fast 50 Award” from the Denver Business Journal, for being one of the top fastest growing companies in the Denver metro area with a revenue growth of 131%. This year Marvin Windows held the forum in Phoenix for their Infinity from Marvin fiberglass window dealers. Marvin has been in the window business for over 100 years, and in 2002 they created their Infinity line after recognizing an opportunity to offer high-end fiberglass windows to homeowners. Lifetime has been doing business in Denver for over 10 years, recently opened a location in Phoenix and looking to expand to other markets in the coming few years.